It was a time of heroes. Not men of myth running round the walls of Troy as in the Greek sagas or Biblical strongmen tearing down the temple walls with bare hands, but mere mortals like us and yet, as unlike us as men can be from one another. In 1911, Scott, an Englishmen, drove men and dogs to the South Pole in a grueling journey, only to find that a Norwegian, Amundsen, had beaten him there by days. The crushing news was delivered in a gloating note Scott found left in the tent Amundsen erected when he reached magnetic South. Scott and his men would die on the return trip, their leader leaving a journal to be discovered next to their bodies so that the world would know of his mens’courage. Ernest Shackleton, who had been on Scott’s 1902 failed expedition to Antarctica, heard of Amundsen’s victory. His wish to be first to the Pole denied him, Shackleton vowed to be the first to traverse the Antarctic continent by foot. He raised the money for the expedition, outfitted a boat suitably named Endurance and gathered a crew who would go with him into history on a harrowing journey requiring superhuman courage. In her haunting book, The Endurance, author Caroline Alexander captured the sheer human drama of the voyage. The ship was trapped and eventually crushed in the pack ice off the Antarctic coast, the crew surviving by living on an ice floe. With the melting of the ice, Shackleton put his men ashore on the bleak, lifeless beach at Elephant Island and ventured off for a 900-mile crossing of the Weddell Sea, known for its killing storms, in a boat hobbled together from the wreckage of Endurance. Surviving the voyage was almost impossible, yet survive they did. Landing on the wrong side of South Georgia Island, Shackleton and two of his men walked for 36 hours, nearly barefoot and with one rope as equipment, across the snow-covered mountains to the whaling station at Stromness. After convincing the station master that the filthy phantom in front of him was actually Ernest Shackleton, lost nigh on two years, a rescue was effected. Not one man of the Endurance’s crew was lost. Shackleton returned to England a hero. But his restless soul demanded his return to Antarctica. He died there at Stromness. Though the whalers are buried facing East to West, Shackleton is buried facing his beloved South. I read the story of the Endurance and Shackleton a few years ago and dreamed my own dream of going to Antarctica someday. While in Norway later, miles to the North of the Arctic Circle, I asked about a strange outbuilding in the yard of the Blood Road Museum. “It is Ernest Shackleton’s boat cabin from the ship he had when he died in South Georgia,” answered the curator. I felt a shiver of recognition and knew I was one step closer to Antarctica, though I stood at the opposite end of the world. While researching another story, I ran across the website for a company called Quark Expeditions. When I read that they offered ship voyages to Antarctica, I jumped at the chance to see the land that called Shackleton ever southward. My photographer and I flew to Buenos Aires, Argentina and stayed at the Alvear Palace Hotel, one of “The Leading Hotels Of The World,” (chosen so with good reason.) Buenos Aires has been called the “Paris of South America” and it is a lovely old city, with graceful buildings, gourmet restaurants, glittering shops, and people so charming, I could (and will) easily spend weeks there on my next trip. After a day of rest, we took an Aerolinas Argentinas flight to Tierra del Fuego, (Land of Fire) quite literally at the bottom of the world. Argentina is a huge county, yet 98 per cent of the population lives in Buenos Aires, leaving the rest a vast, beautiful, and quite empty paradise. Mountains soar, tipped with snow even in “summer,” (seasons, like the water flow down the sink, are reversed here.) Lakes sparkle with a blue so brilliant it hurts the eye. Ushuaia itself, the last town in the last province on the continent, is full of interesting little shops, funky bars (including an Irish one!) and oddly enough, a gourmet restaurant at the very top of the town. Quark Expeditions will arrange your hotel accommodations the night before your voyage begins. Ours were at the Hotel Albatross, overlooking the docks. Under the Southern version of a rainbow, called a fogbow, we boarded our ship, the M/V Orlova, named after a Russian silent screen actress. The Orlova is not a polar icebreaker, (though Quark does trips on those as well, including one with helicopters to make further forays onto the continent,) but a former pleasure boat once used for trips to the Baltic. The cabins however may seem to be refugees from “The Hunt For Red October” and less what Americans think of as cruise cabins. That’s because the Quark trip is an expedition, and you are invited to join the scientists who make up the expedition crew as you discover the virtually untouched wilderness that is Antarctica. Though the cabins are small (with snug berths and tidy bathrooms,) there’s plenty of storage space for your “expedition gear.” A word here about that gear: I spent months picking out clothing to withstand below-zero temperatures, and the temperature never dropped below zero, even with the wind-chill. From the Quark-provided list, what I truly used were waterproof pants and kneeboots; thin ski socks; polar fleece jackets and pants; a windproof outer coat (Antarctica has no moisture in the air, but the wind can peel the skin off your face ... nature’s dermabrasion;) a ski hat with face mask and flexible gloves. Forget the finery. Everyone wears jeans and sweaters on-board. We met our 116 fellow travelers in the lounge and a curious mix of people they were. From folks who looked like they might have trouble puttering around a golf course much less an iceberg, to students with knapsacks. All ages and from many different countries: Finns, Aussies, Canadians, Europeans of all stripes, a smattering of Americans...business executives from New Zealand and English tourists who took off months off their jobs for a South American Tour, retirees, Japanese journalists, solo travelers, French speakers, and oldsters with canes. The expedition leader was Laurie Dexter, born on the Shetland Islands, a silver-haired extreme athlete who survived a 91-day ski trip across the North Pole from Russia to Canada; a skiing and sled-hauling trip to the South Pole; and has run 10 marathons in 10 days. Dexter sported a gold earring, yet looked like a man who had never been a hippie (he had in fact been a theology student in his youth.) I asked him about the earring. The lectures were fascinating. I became an instant expert on penguins (their feathers are waterproof,) albatrosses (one of the largest birds in the world with wingspans up to 11 feet,) pack and brash ice and icebergs (and how they break off glaciers and “calve,”) why the sand is black (the whole continent is one large volcano nursery,) all about other explorers (augmenting an excellent reference library on-board,) and most importantly, how one safely travels in a rubber Zodiac boat (for that is how we made our landings) and how to treat the animals we’d encounter. The birds were the first creatures we saw ... swooping over the deck in huge numbers. Black and white cape petrels (the “pigeons” of the region,) skuas and terns, and finally ... unbelievably, the albatross ... looking like a pterodactyl casting its shadow over us below. The weather got progressively colder the further South we went, sending us thankfully towards the hot soup tureen served at every meal (the food was surprisingly good as the ship carries eight chefs-including a pastry chef ... and the only oddity was that the tablecloths were wet, to avoid shifting plates in high seas) and toward comradely hot whiskeys in the bar at night. 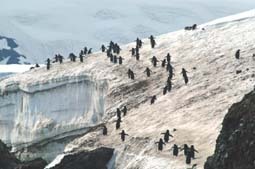 Soon small icebergs – named “bergy bits” – began appearing in the water around us, like ice cubes in a sink full of water and on some of the larger ones, we got a view of their passengers ... penguins, hitching a ride. At last we finished our crossing and assembled to get in the Zodiac boats, which had been lowered over the side. Down a gangplank, stiff as children in new snowsuits, we were helped by the crew into the inflatables and roared off towards land with one of the expedition crew manning the outboard motor. What else they have to do is a sight to see. Ungainly on land (one would think penguins would be adapted to walk on ice, but no ... they fall on their rear ends just like us when they hit an icy patch,) the penguins are different creatures in the water. Tucking their wings beside them, thus becoming football-shaped, they torpedo through the water at incredibly high speeds, hit the beach, and pop straight out of the water like champagne corks to begin their mountain climbing. Though we saw none of the famed Emperor Penguins on our trip, we did see the graphically-delightful Chinstraps (called “Police Penguins” by the Russian crew of the Orlova because they look like they are wearing Keystone Cop helmets) and the curious Adelie (named after an early explorer’s wife,) who clambered round one visitor in a wheelchair and who may come over and explore you if you sit down and be still. Everyone else had wandered off to visit the school (the children stopped classes to welcome us,) and I stayed behind to adjust my camera. I found myself face-to-face with the slug-like youngster, who gave me a few sideways glances, decided I was harmless, suffered me to take a million photos of him, then burped (smelling of fish) and fell asleep. 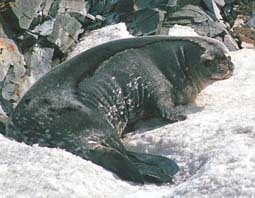 The rest of the group saw a leopard seal (the only dangerous type to approach) catch and eat a penguin, their natural prey. 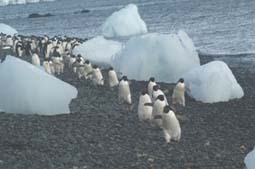 Antarctica is stark and wild and stripped to its essence. Everything is black and white. The penguins, the cape petrels with their tie-died wings, the seals, the pumice beaches and black mountains (looking as though they were molten charcoal just minutes before,) the white snow, the floating chunks of ice. It looked to me as though God had made the place during His monochromatic period ... before He had invented all the Crayola colors. There is no green here, no vegetation of any kind, no trees, no people. It looks as it did when the world began and you wouldn’t be surprised to see a dinosaur step over one of the glacial mountains. In 1967 one of the volcanoes exploded and the historian read us a transcript of the radio transmissions between science stations as it happened. Flaming lava bombs had been blown into the air and the sea boiled the paint off the boats. On one beach landing, we proved how close that eventuality still is. We all earned certificates for actually setting foot on the Antarctic continent, though thicker than usual pack ice stopped us from going as far South as we hoped. I heard the ice scraping against the hull at night and awoke to see a cavalcade of icebergs surrounding the boat. 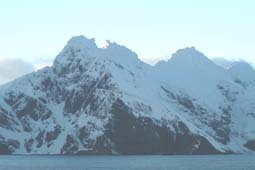 Each berg was larger than a football field and so tall their top could not be seen from the ship’s highest deck. There were miles between each berg and yet we saw 82 of them one day. Weaving through this maze of blue beauty makes one feel very small and the knowledge that in the Southern Ocean there are more than 300,000 icebergs, helps you realize the immensity of the continent. I came away a new understanding of the size of the world and my relation to it. 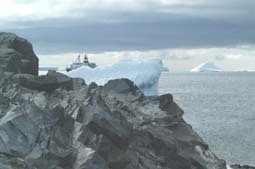 To avoid getting stuck in the pack ice, (even with our modern technology,) we altered course and sailed by Elephant Island, where Shackleton was forced to abandon his men and begin his valiant trek in hopes of rescuing them. We reached the island at 3 am and out of the darkness loomed the forlorn beach where those men starved and froze and prayed that “The Boss” would return for them. I felt Sir Ernest at my shoulder as we looked out on the barren beach and I marveled again at their courage and fortitude. I spent the next morning, up on the bridge, as we maneuvered through and around those lovely treacherous blue mountains of ice, glad to have made my own journey of discovery to the end of the world and even more in awe of those brave men who had come before me. Quark Expeditions conducts trips to Antarctica from November through March on all their vessels, with different itineraries, lengths of voyages, and prices. On the M/V Orlova, the 11-day Classic Antarctic voyage with twin accommodations on the main deck is priced at $3695 pp (hotel accommodations in Ushuaia and all meals were included.) Airfare extra. 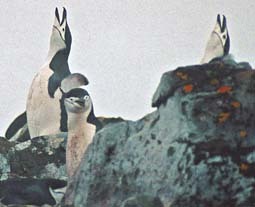 For more information on Quark Expeditions Antarctica voyages, visit www quarkexpeditions.com.